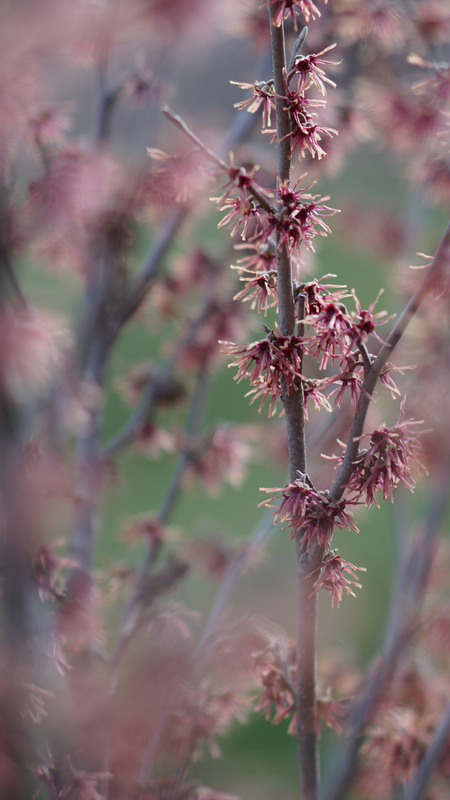 One harbinger of the slow, subtle shift from winter to spring is witch hazel (hamamelis). The varieties of this shrub bloom from February through early March, with tiny flowers – crinkled wisps. We included a witch hazel in the front bed. It has endured sustained sub-freezing temperatures and the regular stiff winds here on Windy Knoll. It seems to be on the cusp of blooming. This was labeled as Arnold Promise, which would have had golden flowers. But they appear to be red. The flowers contrast with the snow overnight, already melting toward what will be an unseasonably warm week ahead.